In Corinth, many receive the Word of God that Paul preaches. HILE PAUL WAITED in Athens for his companions, Silas and Timothy, he walked about the streets and saw many idols standing here and there. He saw that the people of this city worshiped many different gods. They had even built an altar to the Unknown God. There were Jews in this city also, and Paul visited their synagog to speak to them about Christ. In the crowded streets he met some thoughtful, earnest men to whom he spoke daily about the gospel. Others gathered round, curious to hear the conversation. When they heard Paul speaking about Jesus and about the resurrection from the dead they believed he was bringing tidings to their city of a strange god from some other land. In this city was a place called Mars Hills. Here important matters were discussed, and the wisest men of Greece met on this hill. 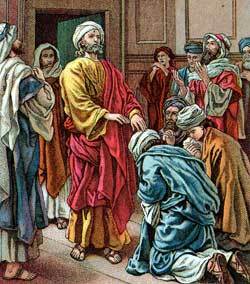 They brought Paul here and asked him to tell about this new doctrine of which he spoke so earnestly on the streets. Then Paul rose up before all the wise men and said: "I saw an altar which you have built to the Unknown God. Of this God I wish to tell you now, for it is he who has made the world and all things in it. He is Lord of heaven and earth, and does not dwell in temples that are made by men. He gives life and breath to all creatures, and has made the people of every nation. This God whom I declare to you is not far from every one of us, and he desires that people of every nation should seek to know him. They should not try to make images to represent him, for he is not like gold, or silver, or stone, fashioned as the idols your own hands have made. The time was when you did not know about this God; but now he commands you to repent of your sins, for the day will come when he will call all men into judgment." Paul then spoke to them about Jesus, whom God had raised from the dead to be the Savior. But when the wise men of Athens heard these words some laughed in scorn, while others shook their heads in doubt, saying, "Come again some other day to tell us more about this strange thing." They did not believe that the dead shall rise again. So Paul left mars Hill and went into the city. Some who had listened to his sermon followed him and asked to know more about Christ. One of them who followed was a chief man of the city. He afterwards believed and was saved. A few others also turned from their idols and believed in the true God and in his Son, Jesus Christ. From Athens, Paul went to another city of Greece, called Corinth. Here he found a man and his wife who were Jews, and who, too, were stranger in the city. Because they were tent-makers by occupation, and Paul also knew how to make tents, he worked with them to earn his living, and on the Sabbath-days he preached in the synagog of the city. Among the Jews who believed his preaching were this man and his wife, Aquila and Priscilla. Finally Silas and Timothy came from Philippi to Corinth, and Paul rejoiced to see them once more. From that time he began to speak more boldly concerning Christ, and many of the Jews opposed him. Then he left them, and turned to preach to the Gentiles. The chief ruler of the synagog and his household believed the teachings of Paul, and many others, too, received his words with gladness. These believers were baptized in the name of Jesus. Because the Jews who worshiped in the synagog would not receive the gospel, these believers worshiped in a house near by which belonged to a believer named Justus. One night while Paul was in Corinth, the Lord spoke to him in a dream, saying, "Do not be afraid, but speak boldly for I am with you and no man shall hurt you here. I have many people in this city who will believe on me when they hear your words." After this vision Paul stayed in Corinth a long time, faithfully preaching the gospel to all who would listen. And many believers were added to the church in this city. When Paul had been there many months, some wicked Jews who hated the believers planned to make trouble for them. They caught Paul and took him before the ruler of the city, accusing him of wrong-doing. But the ruler paid no heed to their words, and Paul was set at liberty. After this the Greeks caught one of the Jews, a ruler of a synagog, and beat him cruelly; but the Greek ruler did not help the Jew. Paul decided to return again to Jerusalem. Taking with him Aquila and Priscilla, he sailed from Greece to Asia Minor. Here he left his friends in the city of Ephesus and continued his journey to Jerusalem, to attend the Feast of the Passover. And from Jerusalem he went once more to visit the saints in Antioch.